The seventh grader cautiously entered the conference room. She carried a tri-fold board, a plastic bag of cards and a handful of blue report folders. 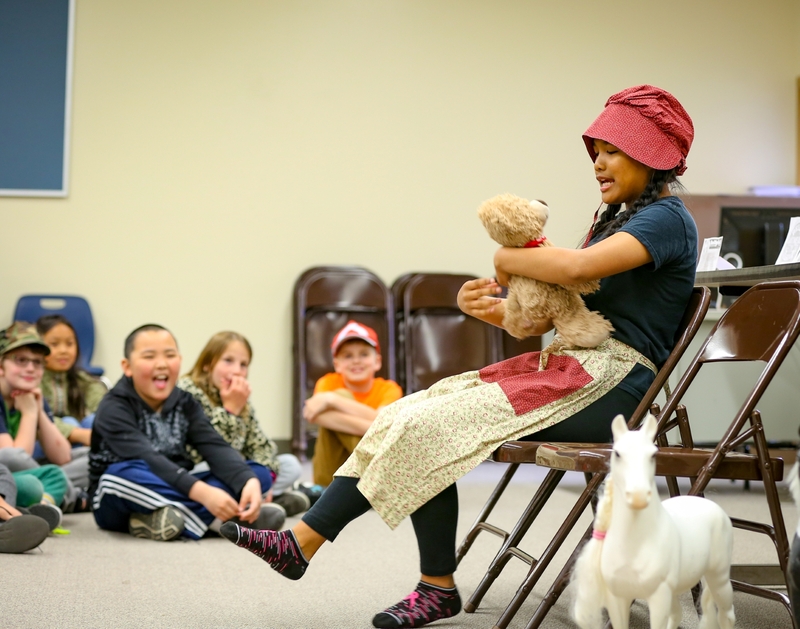 Her classmates had created similar activities as part of a history lesson on the Westward expansion. “Students had an option of old vs. new school,” Ridgetop Middle teacher DJ Sweet explained. Sweet partners with teacher Jessica Bender. For this lesson, students could choose Sweet’s class for a “new school” project-based option or go to Bender’s for a more traditional lecture, textbook and quiz route. 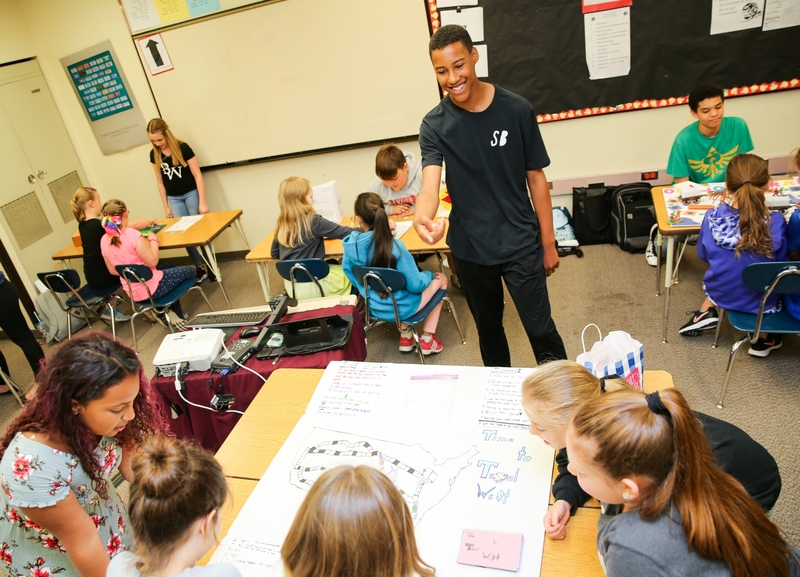 Students were tasked with creating kid-friendly educational activities that they would have to pitch to business leaders, then test with a group of third, fourth and fifth graders from Silver Ridge Elementary. Along the way, they also got pitching tips via an online chat with a Groupon executive. Student products included Oregon Trail-like board games, video games, a play, food and scripts for animatronic characters. Back at the “Shark Tank,” Cynthia explained her “Resettling” game to Sweet, Mike Walton, of Kitsap Public Facilities District, and Kristal Baker, owner and CEO of Express Employment Professionals. “It’s an unusual subject for a game,” Walton commented. They talked about the educational value of the game, targeting older students, adding more action spots to the game board. Baker offered tips on presenting, including memorizing a habitual introduction that helps put her at ease during any presentation. “I still get nervous!” Baker confided. In the following week, Cynthia incorporated some of their suggestions, such as adding action spaces and using natural materials for game pieces. “I also used it as inspiration for new ideas,” she said. Cynthia stood next to her game as a dozen Silver Ridge students entered the room. She watched with pride as the students brought her game to life. “I made that, I taught them that,” she thought. The Silver Ridge students recommended adding facts to blanks spaces. If Cynthia took the game to a real-life market, she’d probably do that. 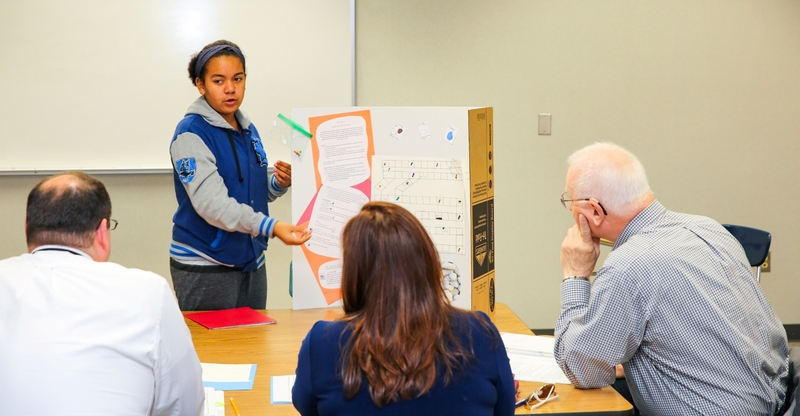 “I like creating something with my knowledge instead of just answering questions,” she said.